I picked up this still because I found the juxtaposition of two major musical stars together in the shot, one white and one black, seemingly functioning as equals, quite intriguing. The film is CAIRO (1942), a musical comedy with a World War II spy theme produced at MGM, and it stars Jeanette MacDonald, Robert Young, and Ethel Waters. Based on this still, I wanted to see the film to determine how big a role Waters had. She’s billed third, so it had to be more substantial than black performers normally got in films of that era. And Waters was quite a big star at the time, maybe not in Hollywood, but certainly on stage, records and the nightclub circuit. I finally watched the film and I’m happy to say she has a big role. Granted, she plays MacDonald’s maid, but she also functions as her secretary and traveling companion and is in a lot of the film and participates in much of the action. Frank Lovejoy would have turned 100 today, March 28, 2012. He died at the age of 50 on October 2, 1962, nearly 50 years ago. 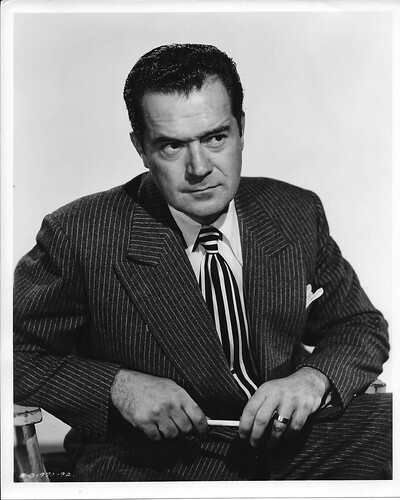 He was an actor who had a ten-year run of lead and second lead roles in a steady stream of westerns, war movies, dramas and crime thrillers before he moved into television, starring in two series, “Man Against Crime” and “Meet McGraw” and guest-starring on numerous other shows. He generally played good guys—in the military or law enforcement—and his gruff, no-nonsense professionalism usually masked a warm core. He was thoroughly believable in every role he played, an everyman drawn into service and trying to do the most honest and professional job he can. This still is from Nicholas Ray’s IN A LONELY PLACE (1950), in which he plays a Los Angeles police detective investigating a murder in which his friend, a temperamental screenwriter with a short fuse, has been implicated. The friend is played by Humphrey Bogart. I DIED A THOUSAND TIMES is a 1955 remake, in color and Cinemascope, of the 1941 crime classic HIGH SIERRA. It’s about a career heist artist who gets paroled from prison in the Midwest through the machinations of an ailing crime boss in order to engineer the robbery of jewels from the safe deposit boxes of a Palm Springs-type resort. Jack Palance plays the criminal, Roy Earle, a part originated by Humphrey Bogart. Palance’s character is quieter, less talkative than Bogart and less ruminative. He’s more tightly wound and quicker to anger and reduces other tough guys in the film, including Lee Marvin, to a quivering jumble of nerves. 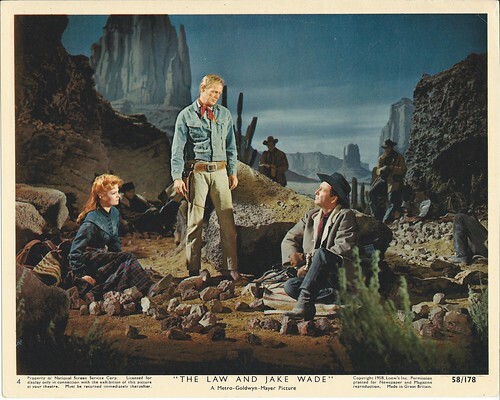 Second in this series is a color still from THE LAW AND JAKE WADE (1958), an MGM production directed by John Sturges (THE MAGNIFICENT SEVEN). I only recently recorded the movie off Encore’s Western Channel and re-watched it for the first time in decades. As you can see, the still shows a nighttime scene shot on a soundstage with studio lighting and an artificial backdrop. The actors are, L-R, Patricia Owens, Richard Widmark, and Robert Taylor. These NSS stills used to be displayed prominently in glass cases set up around the outside areas of the theater and in the inside foyer before entering the lobby. Some theaters made lots of room for such displays, some just didn’t have the space for more than a few. I remember the stills used for such displays being predominantly black-and-white, but I must have seen some in color occasionally. 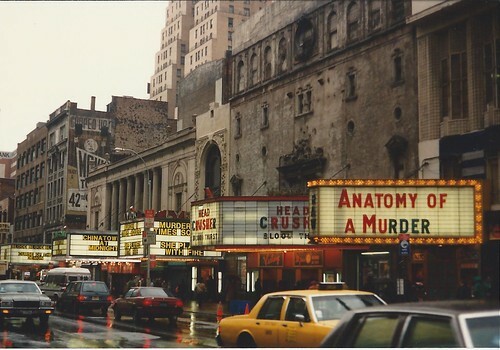 I loved looking at these pictures and the accompanying posters when I passed theaters, no matter what was playing. Even when I’d just seen the movie, I was always keen to see exactly which scenes were displayed and compare them to what I remembered from just seeing the movie. I learned early on that the stills didn’t always match what was in the movie. Sometimes the stills featured scenes that weren’t in the movie at all. I decided to open this series with a color still from MURDERERS’ ROW (1966), a secret agent spoof starring Dean Martin as Matt Helm and produced by Columbia Pictures. 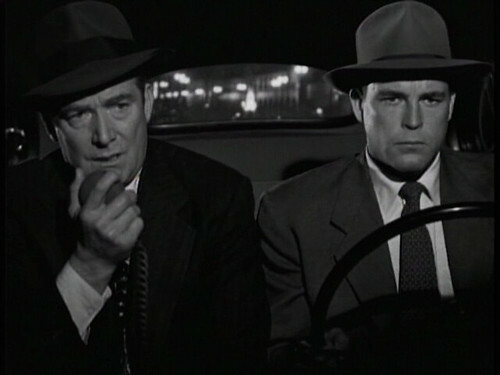 HE WALKED BY NIGHT (1948) is an unusual hybrid of police procedural and pure film noir. It’s a sincere paean to the hard-working men of the Los Angeles Police Department with intriguing glimpses of the attention to detail involved in the solving of crimes and the search for perpetrators, complete with stentorian narration by Reed Hadley (later the host of TV’s “Racket Squad”) and location filming in police headquarters. Yet at the same time, it’s also an unusually intimate portrait of a cold-blooded killer, whose shrewdness and sharp-eyed intelligence allow him to stay one step ahead of the police for most of the film’s 79 minutes.